We are finally seeing the first sights of spring here in Colorado Springs and if you are like the team of local electricians at Front Range Electric, we are, to put it bluntly, stoked for summer. We are ready for warmer days, the ability to walk out our door and not have to bundle up in puffy coats, fleece mittens, and warm hats. However, with all that being said, we are also not quite ready to give up our hot tubs. Though Colorado Springs is notorious for late March, even early June snowstorms, if you haven’t yet cracked open your hot tub, here are a few reasons why you should enjoy your hot tub for as long as you can. It’s easy in the winter and early spring to stay indoors. Very few of us like being cold and it often seems like way too much work to throw on a coat, boots, scarves, and other needed layers. As a result, we stay indoors all day, getting fresh air only in the split seconds or mere minutes it takes to walk to and from our homes, cars, and offices. Getting fresh air is needed for both our physical and mental health. Depending on a lot of factors, during the winter it is easy to stay in a perpetual state of cold. If you keep your HVAC system set low and if it’s extra cold outside it can be easy to feel like you’re cold all the time. Taking a dip in your hot tub a few times a week can heat up your body and do wonders for your health. Cold muscles can become easily damaged if over-exerted. Heat up your body and avoid injury. A hot tub isn’t just a glorified bathtub. It is an place where you can create community, whether it is with your family that you live with or dear friends. Very few don’t enjoy the comfort of a hot tub. Get the most out of your hot tub by spending time with your family and inviting your friends over for dinner and time in the hot tub. The local electricians of Front Range Electric are here for all of your hot tub connection and electrical needs in Colorado Springs. 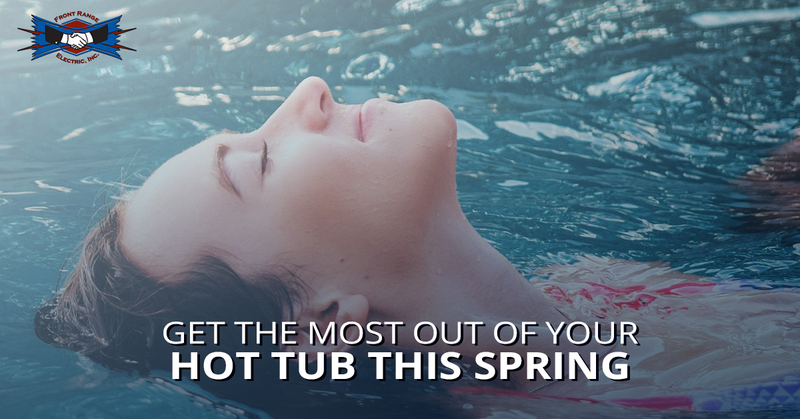 We would love to help you get the most out of your hot tub this spring before it’s time to close up shop and enjoy summer sunshine and adventures in national parks and hiking trails. Visit the Front Range Electric website to learn more about our Top Rated Local® Contractors and to make an appointment to hook up your hot tub and address any electrical problems. Call us today!